Rocky Balboa is a 2006 film written by, directed by and starring Sylvester Stallone as underdog boxer Rocky Balboa. It is the sixth and final film in the Rocky series, which began with the Oscar-winning Rocky thirty years earlier in 1976. Rocky Balboa picks up in present-day Philadelphia, where the protagonist Rocky (Sylvester Stallone) is living alone in an apartment in the city. Adrian has passed away, and Rocky has retired to the quiet life of a restaurateur, charming the patrons of his restaurant with stories of fights long past. Rocky visits his late wife's gravesite regularly, and embarks on a yearly tour of Philadelphia landmarks that held importance to him and Adrian. His brother-in-law Paulie (Burt Young) joins him on this tour, but does so at great personal pain because, in his opinion, he did not treat Adrian well during her life. Rocky counters this claim by reminding Paulie that Adrian loved him as well. We are also introduced to Rocky's son, Robert (Milo Ventimiglia). Robert is the polar opposite of Rocky - a buttoned-down, corporate-minded businessman who is trying to carve out his own place in a very different world. 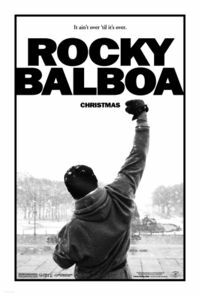 Rocky's relationship with Robert is tumultuous, but it is through the course of the movie that we see the relationship mend itself through Rocky's admonishment to his son that his life is his own and he must be willing to take the chances necessary for an opportunity to succeed. During the tour of Rocky's life with Adrian, Rocky reunites with an acquaintance he met thirty years ago - a girl named Marie, whom he admonished to quit smoking and go to school. She retorted by saying "Screw you, creepo," and ran from Rocky. Now Marie is a bartender, and lives a life of relative poverty - she lives in an apartment in a run down portion of the city, but with Rocky's help, begins to get her life on track during the course of the story. Marie also has a son, Stephenson (nicknamed "Steps") with whom Rocky bonds and who will eventually be one of Rocky's cornermen. Rocky's relationship with Marie blossoms and gives him the strength and confidence he needs to succeed in what is to come. In the film, the sports network ESPN broadcasts a show entitled "Then and Now," hosted by Brian Kenny. It portrays a computer simulation of a fight between Rocky Balboa (in his prime) and the current heavyweight boxing champion, Mason Dixon. It is likened to a modern-day version of a simulation between Muhammad Ali and Rocky Marciano that took place back in the '70s. In the Balboa-Dixon simulation, Balboa is predicted to have won KO13, a fact that riles the current champion. Dixon is much maligned - he is a "victim of his own success", and the boxing community is bored with him. His promoters try to convince Dixon that a fight with Balboa - coming on the heels of the much-talked about computer simulation - would give him much needed publicity, endear him to the boxing community at large, and perhaps open the door to higher-profile bouts down the line. He agrees, and Dixon's promoters begin to put the wheels in motion for such a fight. Rocky, however, is battling his own demons, and he feels that if he got back into boxing on a small level, he might be able to exorcise those demons. His application for a boxing license is initially denied, however, until he pleads his case before the Pennsylvania State Athletic Commission. His license is eventually granted, and soon after he meets with Dixon's promoters at his restaurant. While at first Rocky is hesitant, he eventually agrees to the bout. Both Paulie and Robert have grave doubts about this latest endeavor but Rocky is able to win both of their approvals. Rocky's trainer is Tony "Duke" Evers (Tony Burton). Duke was also Rocky's main trainer in the film Rocky IV, and was a side man in Rocky III. Prior to that, Evers was Apollo Creed's main trainer in the first two Rocky movies. In this latest incarnation, he understands that Rocky cannot train to build up speed, so he must train to build up power. He advises Rocky to start "buildin' some hurtin' bombs." By the time of the fight, Rocky is in phenomenal shape, and intends to give this bout his entire effort. The bout is shown initially as an actual broadcast on HBO pay-per-view, from the pre-fight commentary through Round 2. The remainder of the bout is shot in a much more cinematic style. The actual bout is a back-and-forth affair. Dixon dominates for the first round and the first half of the second round, but midway through the second round, he breaks his hand on a mis-timed punch to Rocky's left hip. This allows Rocky to move in and pummel Dixon for the remainder of the round, even knocking him down. The fight is shown in cut-scenes up until the tenth round. In the tenth (and final) round, it appears Dixon will outlast the tired Balboa. A hard hook sends Rocky to a knee, where he has a flashback to a moment he had with his son only a few weeks prior. In this, Rocky finds the strength to continue. He fights back against Dixon for the remainder of the round; the fighters end up trading punches in the center of the ring. The conclusion of the fight is a nod to the original Rocky in two ways - Rocky gets in the final punch of the fight, a left handed cross. Rocky also loses the fight in a split decision, as he did in the first movie. He exits the arena as the decision is read - the outcome does not matter to him. Instead, it is the mere fact that he lasted ten rounds with a much younger and faster opponent. The movie ends with Rocky speaking at Adrian's graveside. In a nod to Rocky II, he says "Yo, Adrian, we did it." He leaves a bouquet of roses on her headstone, and walks away. As the film (and series) concludes, the final image sees Rocky, in a distance, waving to Adrian's grave before finally fading out himself. The credits roll with a tribute to Rocky's many training runs, with clips of fans running up the steps, that end at the top of the steps of the Philadelphia Museum of Art, at the end, showing Rocky running up the steps one last time as the credits freeze with a background of Rocky facing outward from the museum.